In an effort to get my family moving this summer we all got bikes. As a blogger I am guilty of sitting for way too long and sometimes half a day goes by where I haven’t physically moved. My body is changing and not for the better. I’m getting squishy and… stinky? Good grief, something has got to give! 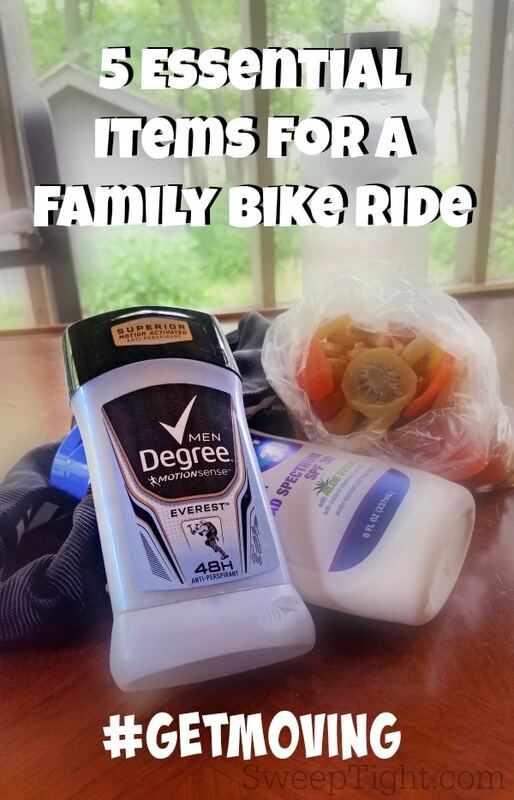 I’m grabbing my family for a long bike ride through the trails just outside my house and have put together a list of important things you don’t want to forget. This post is sponsored by Lunchbox. Opinions are 100% my own. Water bottles. Most bikes have a holder. If not, consider a backpack with a water pouch. Hydration is key for your body’s performance and scent. Trail mix. Make your own with your favorite nuts, dried berries/beans, dark chocolate chunks or whatever. Just make sure you’ve got something to snack on to replenish and fuel your body. Bike locks. You never know when you’ll discover a place that’s worthy of exploration on foot. Always keep a bike lock (for each bike) with you so that you can keep your bike safe while you let your adventure carry you freely. Degree Deodorant. Nothing can take away from the fun like wet, stinky armpits. I may be a lady, but I sweat like a man. And with minimal effort. I actually wear men’s deodorant because I prefer the scents they offer. My new favorite is Degree Adventure Antiperspirant. It has this fancy MOTIONSENSE® formula that activates the more you move. So the more active I am, the better I smell?! It’s magical. At this point I think it goes without saying that you also need helmets and any other safety equipment for your family. Injuries are no fun! Walgreens has teamed up with Degree to bring us the motivation we need to get moving this summer. When you buy Degree at Walgreens you’ll get a code on your receipt with a qualifying purchase that can be used online to unlock excellent health and wellness resources. Take the Degree Get Moving challenge with Chris Powell, celebrity trainer and transformation pro, and take your fitness training to a whole new level. During the challenge consumers will log their activity and track their progress using wearable technology through a custom partnership with MapMyFitness. The challenge starts TODAY (July 1st) and runs through August 17th. Enter here! In addition to tracking your challenge, you can find workout tips, nutrition information, and more information on Degree products. Don’t forget to check for in-store offers and coupons too! 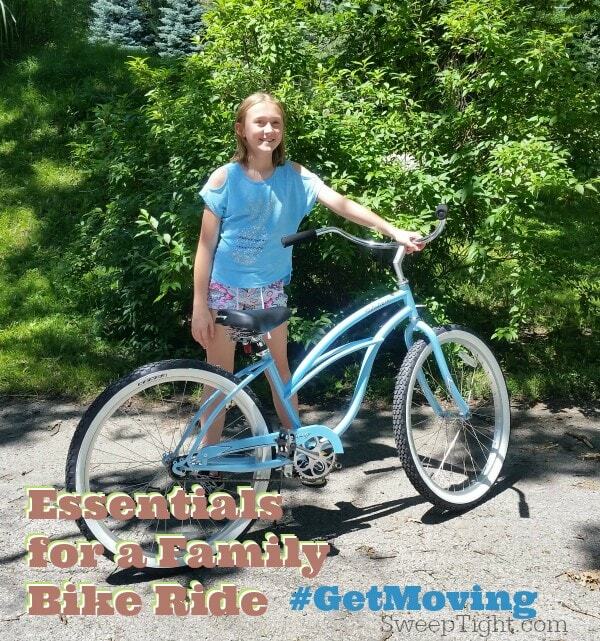 What ways are you going to #GetMoving this summer? Maybe a family bike ride? We have been swimming more often, and I just got a bike. I am so excited for neighborhood bike rides! I plan on taking early morning walks. We take walks in the evening. I have been doing a lot of golf. I ride my bike, or walk or go swimming! I am very active! I plan to go on more nature walks. We just got a bat-mitten set. I plan to go swimming and spend time outdoors playing with my puppy. I plan to go hiking with my family. To be more active this summer we are planning plenty of outdoor activities, like we just put up a badminton net in the yard and we have been swimming in our pool. I plan to be more active this summer by swimming and hiking with my family. I am walking and eating healthier. I am also choosing water to drink over other things. We take long walks in the evenings. My daughters are playing lots of basketball this summer and I am walking to stay fit. We plan to go kayaking this summer. I plan on taking my dog for long walks every day after work. I have been taking short walks and building them up. When it cools down I want to walk around the lake. We are taking family bike rides, going kayaking, walking the nature trails… plus we walk our dogs and our foster puppies 2x’s a day. My physical activity is limited by congestive heart failure, but I plan to spend more time in my garden and walk more often. I plan on training for a half marathon and going to the gym. Walk during my lunch break at work, while the weather is nice! We plan on spending more time at the beach! Walking more often. I’ve been trying to walk daily early in the morning around my neighborhood. I plan on walking around our neighborhood more to try to get into shape. Just opened the pool for the season so lots more swimming! I like to go running outside in the evenings once the sun has gone down. Yoga and paddle boarding are my faves, shocking I know! But I’d love to try scuba diving and sailing! And you know a round or two of hopscotch with the kids doesn’t sound so bad either! I plan to continue taking my nightly walks. I plan to go swimming! I joined a tennis league and recruited a friend to go jogging several times a week to get more active! We take daily long walks and go swimming. Thank you! I plan to walk a lot more at the local track. I plan to swim to be more active this summer. I’ve been running this summer more. I walk 5 days a week and bring my son with me at least a couple of times. We also play more in the backyard. I plan to walk at least 10,000 steps per day. I an going for bike rides to be more active. I will be doing a lot of walking and swimming! I’m going to do more walking and swimming. I’ll be going for more walks along the beach. My family and I have been trying to take a walk everyday or go swimming. I try to stay active by going on walks with the kids or swimming! We will be doing alot of swimming! Carter is turning into a fish this year! He just loves to be in the water! I plan on going swimming and working out in the yard more. I will be biking more this summer! I plan to walk more and do more outdoor activities. I plan to walk more outside – instead of just on my treadmill. I plan on increasing the number and intensity of my walks with my dog this Summer. I plan on running my first 15k on july 12th! I plan to go on long walks at the park or beach. I plan to go for walks more often! My hubby and I have been going on trail runs to be more active. We finally moved to an area with sidewalks and have been walking our dog daily. He loves it and so do we. Our oldest granddaughter is learning to ride a bike so bike rides are next. Can’t wait! I plan to do more swimming to be active this summer. I’ve started jogging and lifting weights this summer to prepare for a 5k called warrior dash to keep me motivated to be fit this summer! We would definitely like to go on some bike rides and spend a lot of time swimming! I do not have to make plans to be more active during the warm months because it being warm causes me to get moving cutting grass, trimming shrubs, tree limbs, on the lake skiing and swimming, walking/running more simply because the weather allows it, these are a few things that come to mind easily. Therefore we will be moving more. I’ve been teaching zumba weekly and doing it outside to get people out in the sun for some Vitamin D! I have been encouraging fresh air and movement! I plan on going to the lake several days a week with the kids and swimming! Taking advantage of our great hiking trails! Enjoying the outdoors! Soon it will be Winter and difficult to enjoy the outdoors! I am going for walks and doing yoga. I ride my bike whenever I go somewhere the majority of the time. We take evening walks in our subdivision.We are going to start medal detecting soon so that will get us up and moving. Take some walks in the part and get moving! We do a lot of swimming in the summer to help keep in shape. Drinking more water and running a mile in the morning. Drink more water and go for a walk each morning. I plan to walk more and go out to the beach and swim more! I plan on walking more with my dog !! I plan on doing zumba! I plan to take a long walk everyday. I’ve recruited my neighbor to get out and walk after dinner. Every bit helps! I plan to swim more. We go for jogs/ walks at the local park and try to keep at it for at least 30 minutes! We are using sunscreen when we’re outside walking, and drinking lots of water! Going on walks with my kids when I am able! We do a lot of fishing and crabbing in the summer. I plan on riding bikes and roller skating with the kids as well as working outside in the garden to be more active this summer. I plan to take walks.